Flood Insurance Rate Maps (FIRMs) are a good place to start when identifying your hazards, but have many limitations. First things first: how do you get your flood maps? Your community should have paper copies, but if you’d like them online, head to this page on FEMA’s Map Service Center’s website where you’ll be able to get a FIRM in one of several ways. Once you’ve gotten your FIRMs, now you need to correctly interpret them. This can be complicated. Following are some resources to help. The FEMA introductory fact sheet, Using a Flood Insurance Rate Map (FIRM). The FEMA Map Services Center, which maintains copies of all FIRMs and FIS reports. The National Flood Insurance Program website, which has information on FISs, FIRMs, and other floodplain management issues. FEMA also offers an “ask the experts” service: email your question to asktheexpert@riskmapcds.com. They claim most inquiries are answered within 5 business days. 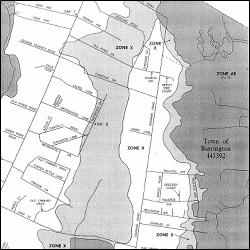 While written for Massachusetts, the Massachusetts Office of Coastal Zone Management article, The Art and Science of Identifying Flood Zones has useful general information on reading FIRMs. Also see: understanding the limitations of FIRMs and FIS reports. FEMA is in the process of updating FIRMs for Hancock, Harrison, and Jackson Counties. Read about the process and the schedule here (pdf) or here (website). In September 2007, the state launched the Mississippi Geospatial Clearinghouse. It houses the latest Flood Insurance Rate Maps as they go live, and the maps that can be viewed and printed from this site are superior to the FEMA based product. The state recommends that they be used by local floodplain administrators.